Courtesy of BERKSHIRE HATHAWAY HOMESERVICES FLORIDA REALTY. 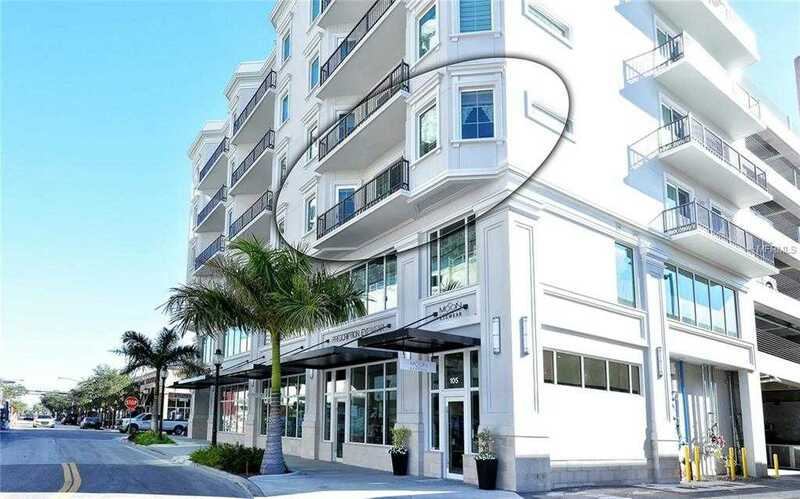 Superior walkability from this 2017 built 2bd, 2ba condo with terrace, overlooking Lemon and Pineapple Streets in the heart of downtown Sarasota. A light and bright residence with high ceilings, beautiful wood flooring and a modified floorplan. The kitchen offers 42 8221; wood cabinets with crown, under cabinet lighting and granite tops. The master has a nice sized walk-in closet and en-suite bath. Soak in the city life below on your private terrace accessed from both the master suite or living room. Only 5 units per floor, secure entry and elevator, plus an assigned parking space, right outside the door, on the same level as the apartment. Don 8217;t want to cook? You have a great selection of fine eateries such as Hyde Park Steak House, Boca, and Bricks Smoked Meats literally steps away. Leave your car and enjoy a plethora of art and cultural venues, fine dining, and boutique shops. Whole Foods, a weekly Farmer 8217;s Market and our beautiful Bayfront with marina are all just a short stroll away. Whether you are looking for a full-time downtown condo, a pied-a-terre or a winter get-away, you must visit 1500 State Street. HOA fees are $372.00 per month. Pet friendly and 1-month minimum rental policy. Schedule your private showing today. Restrictions: Refer to condo docs. Please, send me more information on this property: MLS# A4429658 – $595,000 – 1500 State St #304, Sarasota, FL 34236. I would like to schedule a showing appointment for this property: MLS# A4429658 – $595,000 – 1500 State St #304, Sarasota, FL 34236.